Worldwide CRM Applications Market to reach $29.7 billion by 2022, compared with $27.1 billion in 2017 at a compound annual growth rate of 1.9%. In 2017, the top 10 CRM software vendors accounted for nearly 60% of the global CRM applications market which grew 11.85% to approach nearly $27.2 billion in license, maintenance and subscription revenues. Last year Salesforce led the pack with a 25% market share riding on a 23% jump in CRM revenues. Adobe was #2, followed by Oracle, SAP and Genesys. Through our forecast period, the CRM applications market is expected to reach $29.7 billion by 2022, compared with $27.1 billion in 2017 at a compound annual growth rate of 1.9%. Customer Relationship Management includes applications for sales force automation, marketing automation, customer service and support management such as email automation. Social Media Management, Customer Experience Management, Activity and Participant Management are among some of the newly available CRM applications available via Cloud delivery. As Salesforce aims to expand with price hikes, enlarged ecosystem and recommitment to its SFA roots, seismic shifts are driving a wedge among key vendors within customer service and marketing automation segments as restructuring moves dim outlook of incumbents. 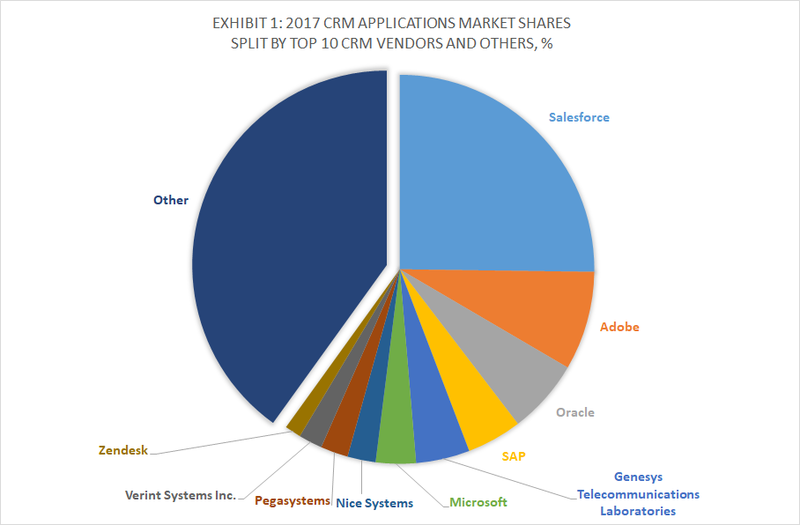 Here are the rankings of the top 10 CRM software vendors in 2017 and their market shares. 1 Salesforce Subscribe Subscribe 23.21% Subscribe The recent buy of MuleSoft will be instrumental for Cloud integration, especially in helping customers extend into non-Salesforce systems. 2 Adobe Subscribe Subscribe 24.72% Subscribe Acquired Marketo for marketing automation and Magento for eCommerce as it pivots from content to CRM and aims to unseat Salesforce. 3 Oracle Subscribe Subscribe 3.41% Subscribe Oracle Digital Assistant is reshaping its CX offerings by enabling conversational AI for retailers to engage with customers using voice commands. 4 SAP Subscribe Subscribe 6.40% Subscribe Spending $8B in its biggest purchase, SAP acquired Qualtrics for survey and experience management apps. 5 Genesys Telecommunications Laboratories Subscribe Subscribe 40.00% Subscribe Genesys PureCloud for customer engagement and communications, signed deals with more than 500 customers in the first three quarters of 2018, resulting in nearly 1,300 to date. 6 Microsoft Subscribe Subscribe 1.10% Subscribe Microsoft’s CRM strategy now extends beyond Dynamics 365 to cover Teams for collaboration, Office 365 for content and ERP for back-office integration. 7 Nice Systems Subscribe Subscribe 76.77% Subscribe After beefing up its CRM strategy with InContact buy, Nice announced X-Sight for financial crime and compliance platform-as-a-service. 8 Pegasystems Subscribe Subscribe 16.73% Subscribe Upgraded robotic process automation features for customer service and unveiled T-Switch that offers businesses AI transparency controls to mitigate data risks. 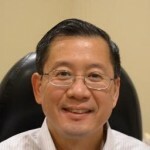 9 Verint Systems Inc. Subscribe Subscribe 4.43% Subscribe Acquired ForeSee for CX measurement, feedback, replay, text analytics, case management, ratings and reviews to expand Verint’s voice of the customer offerings. 10 Zendesk Subscribe Subscribe 38.11% Subscribe Acquired Base for sales force automation to complement Zendesk’s customer service and support apps. On the buyer side, customers are investing in CRM applications based on new features and capabilities that are expected to replace their existing legacy systems. In many cases, competitive upgrades and replacements that could have a profound impact on future market-share changes will become more widespread. Since 2010, our global team of researchers have been studying the patterns of the latest CRM software purchases by customers around the world, aggregating massive amounts of data points that form the basis of our forecast assumptions and perhaps the rise and fall of certain vendors and their products on a quarterly basis. Updated continuously, our database features extensive CRM win/loss analysis. Each year our research team identifies tens of thousands of these customer wins and losses from public and proprietary sources. An expanded version of this report covers the top 200+ CRM Software vendors, offering in-depth analysis of the market dynamics, vendors’ Strengths, Customers, Opportunities, Risks and Ecosystems as well as their ability to gain Shares (SCORES) within their respective space. We also offer win-loss analysis of the quarterly wins of these top vendors and whether incumbents and upstarts pose any real threat to their standing amid shifting market requirements and user preferences. A good research about the CRM software in the market. CRM act as the tool which increases the communication between the customer and the management. It helps the marketing team to generate leads and the sales team to convert it into the customers. Because CRM helps to track the customers. Hey, Miso thanks for posting this article. It is very informative and helpful. Also you have done a great research. Keep sharing your valuable knowledge. Hi Miso, great stuff. Who are some of the vendors in your ‘other’ category of CRM vendors. The up and comers if you will. Thanks in advance.